So last Friday I attended the Zombie Apocalypse at the Forest of Marston Vale which is the biggest zombie apocalypse event in Bedfordshire. Basically this is a walk around Marston Vale forest in the dark where you have to make it all the way around without being attacked by one of the 40 zombies patrolling the pathway. It was advertised as being for adults only and so I had mild hopes it might be a bit scary, which it wasn't, but it was something different, and something fun. So I got a lift up to Bedfordshire with my best friend and her friends, we started as we meant to go on with some pre drinks. The event started at 19:00, on arrival at a visitor centre we all had to sign a form to say we are fine with being scared, that we wouldn't attack any of the undead, and that we wouldn't run (and various other stuff). We were then each given a white T-shirt with a zombie silhouette and the event logo on it...I would include a photo but I have literally no idea what happened to my shirt at all, maybe too much of my vodka and coke I was drinking fogged my memory (drinking it for Dutch courage of course). Around 20:00 we were taken out the visitor centre into a field where the event organiser explained how it would work. The task was to complete a circuit of the 2km forest path, making our way past the 40 zombies as we did so. 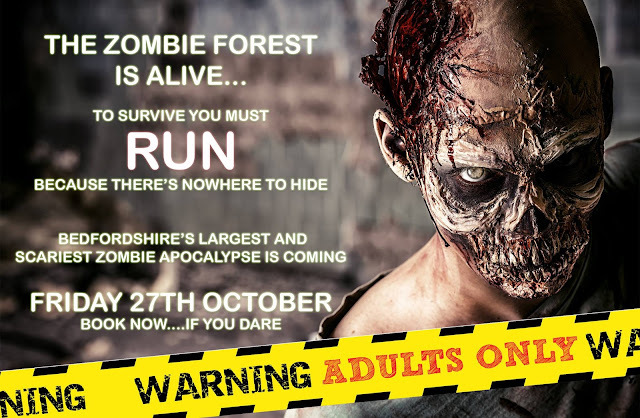 If we made it back to the visitor centre without our T-shirt getting any blood on it we could get our ticket price refunded (£15), however the zombies aim was to touch your shirt with their blood stained hands. We were instructed to stay on the path at all times wherever possible, and that we would be leaving in groups. Luckily we were in the first group to be let go, so off we went, not getting too near the front of the crowd. I think there were roughly 200 people who attended this, being let go at one and a half minute intervals. After a slightly confusing start in which we were led down the wrong path and were put back on track by a stressed looking attendant our walk of terror began proper. What made a lot of this event fun was that it took place at night in mostly pitch blackness. It was always easy to see other survivors due to the white T-shirts showing up, so whenever you could see a lone figure, or figures stumbling around in the distance you knew they would be one of the hungry dead. Usually you could tell when a zombie was ahead due to the amount of screams coming from that direction. During the first encounter we managed to lose one of our four strong team, later once we had found him he swore that he had just got separated but I can't help that feel he ran off in a moment of blind panic! With so many survivors on the pathway it was quite hard to avoid the undead, such as one time a stranger grabbed me and used me as a human shield as she passed by one of the rambling corpses. There was a dizzying amount of phone torches, head torches, and camera flashes to try and identify where the dead were situated. Personally I didn't like the idea of being illuminated so I restricted myself to camera flashes to see ahead. I had an ulterior motive of being determined to get a photo of a zombie, or better, a zelfie. However as you would no doubt be able to tell it is actually surprisingly hard to get a decent picture of a creature that is endlessly heading towards you with food on their rotted minds (and I am incapable of not pulling some sort of accidental ridiculous facial expression when I'm in shot). My friend was the first of our group to go, taken at the first couple of undead, I'm sorry to say I wasn't much better pretty much stumbling into one of the dead a few minutes later. Our third member did not do much better, and managed to trip over on two different occasions, the second time a concerned hoodie wearing zombie broke character to check she was ok, bonus points for being a decent person, but minus points for not being committed to the role enough! Damned if you do and damned if you don't for sure; a horror based moral dilemma. So it was all down to our fourth member (who we eventually relocated after his heroic flight), but at some point he too got taken. The problem with being gotten was that it was harder to care too much if zombies attacked you or not. Now it is completely understandable all the undead actors are allowed to do is put their hand on your white shirt, personally it would have been cooler to have been dragged to the ground screaming (as happened at a live action zombie roleplay event I went to once when three ghouls cornered me and did indeed drag me to the ground). The make-up for the zombies was all pretty great looking, it really helped with the atmosphere that it was dark and so harder to see them that well. I was also impressed with how much they got into their roles. I had many different challenges when I would try and work out how to duck and dive around once people in my way, it was easier when there was a crowd of survivors as the undead would get confused with choice. On multiple occasions it was just me, slowly backing away as the zombie followed, groaning, and with a completely dead expression on it's face. With the amount of nervous laughing and screaming I was doing I loved that the actors never showed any expression, the ones with freaky contact lenses in particular really impressed me. The most cheapest and legal way I can think of to make it feel like real life zombies are actually after you. The woods themselves were sparsely decorated, it would have been more fun if there had been set decorations as the one part that had a few bodies in sacks hanging from the branches of a tree really stood out to both me and my friend. Also of the zombies themselves, I think more trickery would have benefited. Say put a rotter in a white T-shirt like everyone else, or have one wearing a working head torch. Again the most memorable zombie to me was the unique one who was hiding in a bush until half of us had walked past then he suddenly burst out to give us all a great fright. 40 actors was cool but there were huge parts of the trip around where there were no zombies for ages which was a shame, though as my friend said it did build up suspense. Also I had hoped for a undead gauntlet at the end, instead it just sort of petered out (though I did become completely entangled in thorny vines while giving a wide berth to the final ghoul, cut up my leg a bit but was quite funny). While Zombie Apocalypse at the Forest of Marston Vale wasn't really scary, and did feel a bit overpopulated with humans as opposed to zombies it was a fun time, it was something different, and something memorable. The geek in me wished there had been some sort of fictional story given to us for why we were walking around the wood for added motivation. Still a big rotted thumbs up from me!